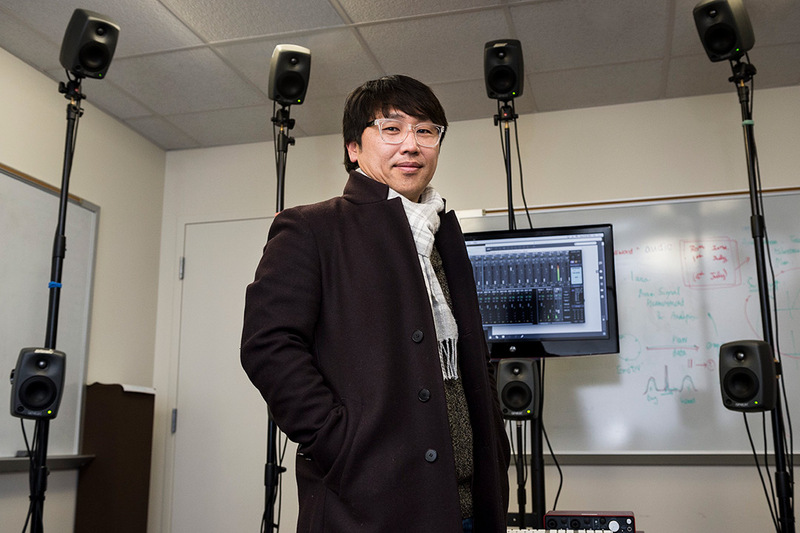 Sungyoung Kim, an associate professor of audio engineering technology at RIT, is leading a team of researchers to develop a set of tools using advanced augmented and virtual reality technology to preserve and replicate the acoustics of historical venues. Sungyoung Kim, an associate professor of audio engineering technology at Rochester Institute of Technology, is leading a team of researchers to develop a set of tools using advanced augmented and virtual reality technology to preserve and replicate the acoustics of historical venues. The project would bring attention to the overlooked work in preserving aural heritage. A. Sue Weisler Sungyoung Kim, far right, has has been researching new audio engineering technology trends and will lead work this spring to preserve the unique acoustics of several national and international landmarks. 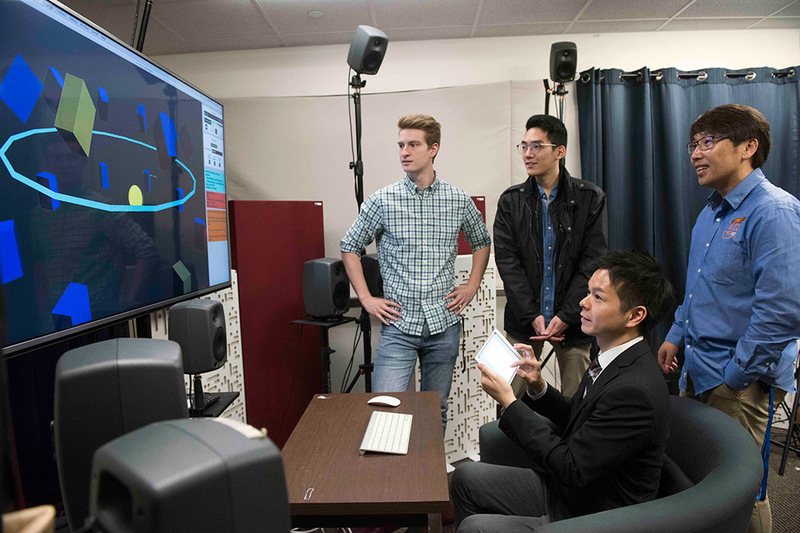 He is seen here with students Jacob Cozzarin and Kyunghwan Sul, and a previous guest to his studio, Shu Kitajima from the Japanese Broadcasting System. Auralization is a process to simulate a unique acoustical environment, or a sound field, in a virtual or physical space. Currently, preservation of images and visual information is a research trend, yet without appropriate auditory information, visual representation of cultural heritage in any format could mislead users. Auralization is equally important to visualization for the seamless re-creation of it, Kim explained. The team received a three-year grant from the National Endowment for the Humanities (NEH) for $347,702 for “A scalable method for digital preservation and access to aural heritage” to focus on spaces considered culturally, architecturally and temporally distinct examples of rare aural heritage. Researchers on the team include Doyuen Ko, associate professor of audio engineering at Belmont University in Nashville, and Miriam Kolar of Amherst College, where she is the Five College Mellon Postdoctoral Fellow in Digital Humanities. Kim worked on similar projects over the past 10 years, several while he was a research associate with Yamaha Corp. in Japan. The current project, while similar, is more comprehensive, focusing on preservation and some aspects of live performance. The captured aural information will be reproduced through a scalable method developed by the researchers that would allow users in the different types of venues to choose reproduced formats. For example, a common reproduction format can be heard through headphones or speakers in a home theater system.